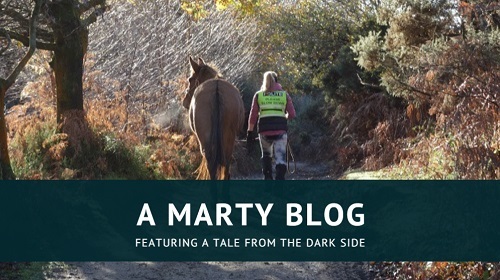 A little while ago on the Mulography Facebook page, I shared a Horse & Hound article about a surprise mule that had been born on a showjumping yard in the UK. The comments on the article itself are fairly benign and are mostly just a debate about colour genetics, but I found myself utterly fascinated by the huge discussion on the H&H Facebook share. The amount of people who were adamant that it couldn’t possibly be a mule was staggering, not least because they listed reasons like “it was too pretty”, it’s “head was too fine”, and simply that it “didn’t look like a mule”. It led me to wonder what exactly people think a mule looks like. In all fairness, mules are not common in the UK. We have a few hundred here but many of that number live in sanctuaries, due to an overwhelming lack of mule savvy and, dare I say it, horse savvy. 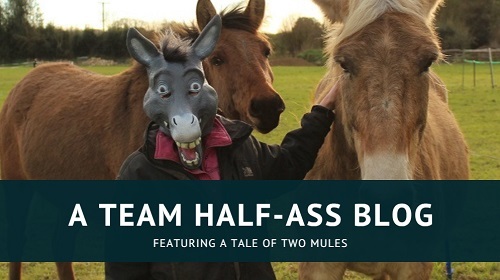 I can’t really blame folk for believing stereotypes and weird, half-understood ‘facts’ when they simply aren’t being exposed to mules – most Brits will have never seen one in real life. Anyway, I started thinking about this. 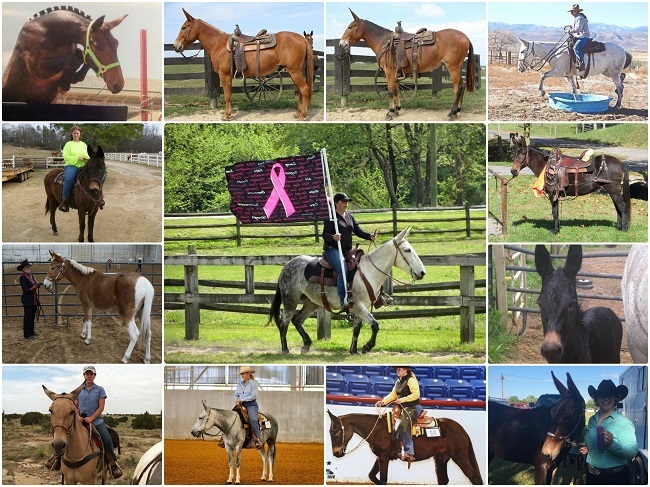 I thought it might be a fun use of the blog to gather several images of mules – from many different breeds – and display them here, in one post, to show that a) mules do not come in one shape or size and b) surprise! Mules are pretty! I didn’t want to just take photos without permission so I posted on my favourite group, Mule Girls, to see if anyone would be interested. And what a fantastic response I got! I was honestly only expecting a few replies, but I was thrilled with how many people liked the idea and wanted to share photos of their gorgeous mules with me. Thank you to everyone who took part. Bearing in mind that Mule Girls are a predominantly American group, I suppose I shouldn’t have been surprised by the amount of Quarter Horse mules! They were definitely the largest demographic. Clockwise from top right: Kat, owned by Marsha Arthur; Ms Kate owned by Marilyn Conley; May Blossom, owned by Lydia Burroughs Key; Jezebel, owned by Lauren McCain; Rumor Has It and My Strange Addiction, both owned by Kristin Stolee; Willow, owned by Julie Justman; (name unknown), owned by Jennifer Allen; Miss Sarah, owned by Dorina Hennings; Fred, owned by Cindy Hanson; and two mules whose images I took from a sale site, as I realised I had two blank spaces – if they are your mules and you would like the images removed, please do not hesitate to contact me. Next up were the spotted mules. I don’t think we have any spotty mules in the UK, which is a shame, because they are real lookers! 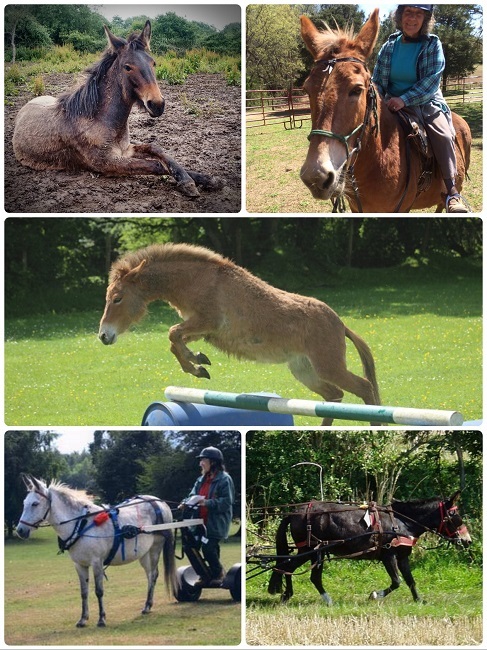 Clockwise from top left: Wash, owned by Jackie Schultz; Zeque, owned by Laurie Lager Sorenson; Maurice, owned by Sarah Eyre; and Mesa, owned by Rita Newsom. And then my favourite – the draughts! Mules and heavy horses are my two great equine loves, so the combination of both is perfection as far as I’m concerned. Draught mules are also a rarity in the UK, although they are around … I need to persuade some of the owners to give me a Mule Tale! 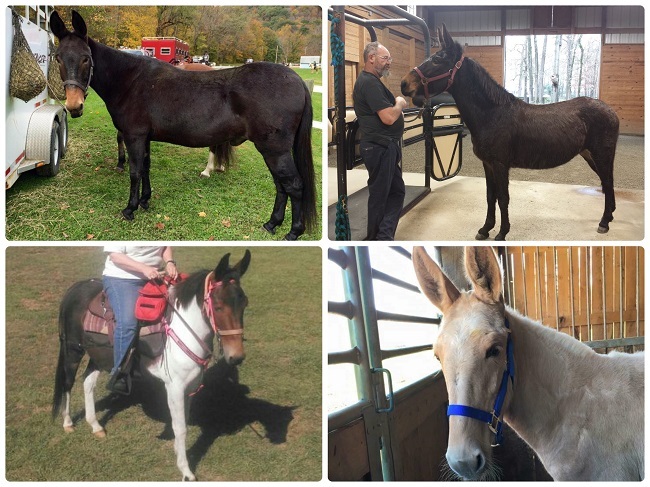 Clockwise from top right: Millie and Mike (Belgians), and Katie Sue (Belgian/Percheron), all owned by Bethany Crawford; Muhl, French Draft mule owned by Conny Röhm; (name unknown), Percheron mule owned by Kelly Sanford; and Robin, Percheron mule owned by Natalie Henderson Baird. Gaited mules seem to go for big money in the States and are very popular, due to their incredibly smooth ride. As far as I know, we don’t have any of them over here either; gaited horse breeds are quite unusual in the UK. 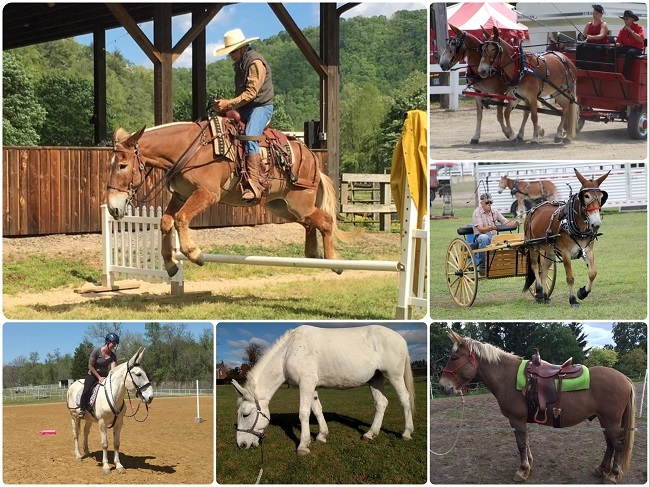 Clockwise from top left: The Judge, Tennessee Walker mule owned by Debbie Moser Sulkowski; Hank, Missouri Fox Trotter owned by Dorinda Hennings; (name unknown), a Kentucky Mountain x gaited Mammoth owned by Tammy Haney Hensley; and Flash, Tennessee Walker mule owned by Dorinda Hennings. Pony mules are what we are used to in the UK. I think the biggest mule here is Napoleon, who stands at 16hh and is owned by my friend Helen (I have asked her for a Mule Tale, but she’s an exceptionally busy lady!). Large donkeys are very rare so it’s unusual for a horse to deliver a mule foal, unless specifically bred – although it has happened, as told in Honey’s Mule Tale! 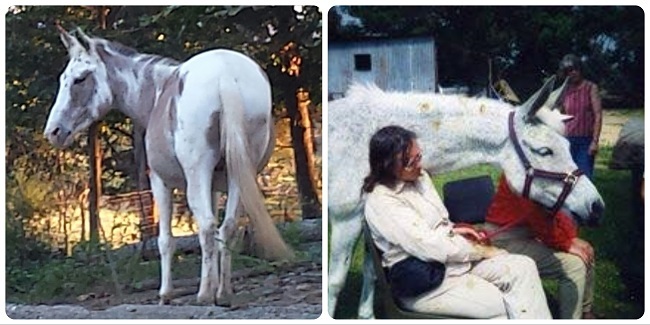 Clockwise from top left: Inara, cob mule owned by Ellen Cochrane; Willow, owned by Carol Juarez; Charcoal, Shetland mule owned by Ruth Bickford; and Blue, Welsh mule owned by Jennifer Williams. L-R: Picasso and Malaga, owned by Jennifer Williams; and Marty, owned by yours truly. I have grouped the next three in as “sporthorses”, purely for the sake of ease. L-R: Rista, Thoroughbred/Warmblood mule owned by Kelly Sanford; Phlossi, who I foolishly thought was TB but should actually have been in the Quarter Horse line-up (my bad! 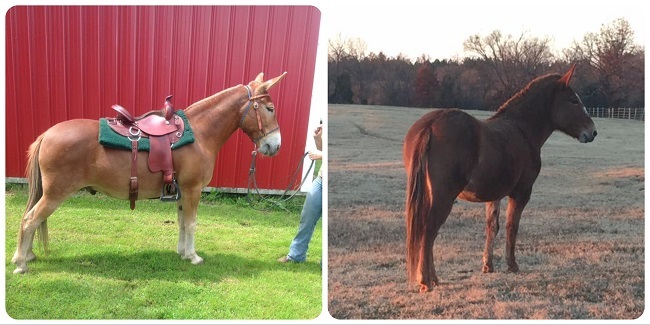 ), owned by Penny Duke; and Honey, who – although pony-sized – is actually out of a Holsteiner mare! Owned by Sarah Hemmings. L-R: Gus, owned by Cindy Hanson; and the wonderfully named Miss Luna Lovegood, owned by Jo Ann Ferguson Kale. 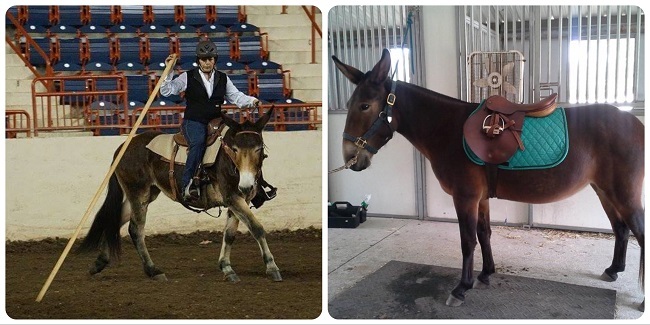 L-R: Bonnie Belle, Morgan mule owned by Carole Haskins South; and Katie, Stockhorse mule owned by Jennifer Ann Mcrae. Hinnies are what you get when you have a horse father and a donkey mother. They aren’t quite as common as mules, but it is very difficult to tell them apart; often, the only way to know for sure is if you’ve actually seen the dam. They generally look more horse-like than a mule, are usually smaller and have slightly shorter ears. L-R: Rupert, owned by Gretchen Anthony; and Sarah Lee, owned by Jennifer Williams. So there you go! This is by no means a comprehensive list. 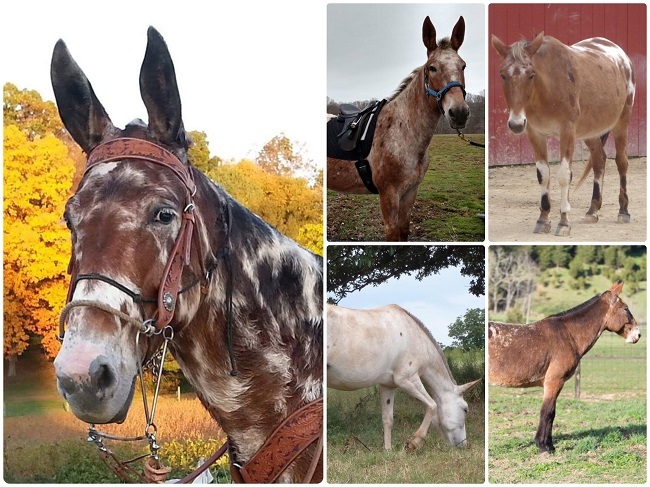 I haven’t even looked into the donkey side of mule parentage here; many of these shown are by Mammoth jacks, but of course the donkey breed plays as much a part in the appearance and temperament of the mule as the horse does. This is merely a starting point. Hopefully, the next time an internet expert starts making daft claims about what a mule ‘should’ look like, you might be able to point them in this direction. One last thing – I am very pleased to say that I have been able to bring you an image of the rarest mule in the world. 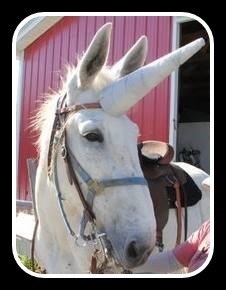 Many thanks to Kelly Sanford for supplying a photo of the magical, the mystical, mulicorn! One does not simply walk into Mor-dogs.